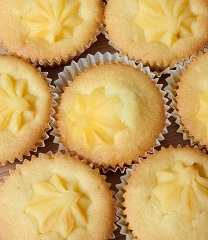 A vanilla cake or cupcakes layered with a Custard Filling is so simple and understated and as a result somewhat under-rated. This is a truly spectacular combination. A white cake or cupcakes with a splash of amaretto or other dessert liqueur and custard layers is a traditional birthday cake in many households around the world. It looks difficult to make but looks can be deceptive. Me and custards have become a bit of a joke in my household. I always have a mental block when I come to make them and I seem to make them way too thick or way too runny when I make them from memory. Custard is one of those things where I must follow a recipe and this recipe is great. This is a pouring custard that sets on refrigeration and can then be spread or piped onto cupcakes. Heat the milk and cream over medium heat until hot, but not quite boiling. Whisk the egg yolks and sugar in a medium bowl until light and fluffy. While continually whisking, pour the warm milk mixture over the egg yolks. Cook the custard, stirring continually, over a very low heat until mixture thickens and coats the back of a spoon. Strain the custard through a sieve.